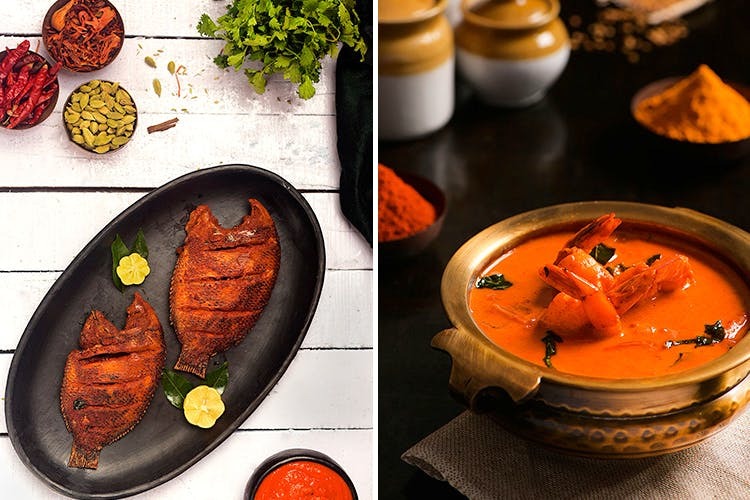 Stay indoors and savour fine flavours from the Malabar as Delhi’s acclaimed Mahabelly dishes out spicy stir-fries, and coconutty curries in G-town. With a menu that runs into several pages, picking favourites isn’t an easy call, but we suggest you start your backwater flip with the creamy and comforting Meen Moilee. A traditional fish stew prepared with coconut milk and fragrant with whole spices, this pairs well with steamed rice. An unusual surprise is delivered by the Prawn Mango Curry, a signature from the region that is little known, and teams up juicy crustaceans with a tart curry for great effect. For a robust meaty treat that works just as well as an easy bar bite, pick the Erachi Fry- succulent pieces of tenderloin lovingly laced with coconut slivers and crisp curry leaves- smoky, hot and addictively good! The grass is greener on the vegetarian side too. The Vegetable Stew is mildly spiced vegetables simmered in delicate coconut milk and easily mopped up by hot appams. For a heartier kick, get a portion of the classic Kadala curry, spiced black gram in a coarse coconut gravy traditionally accompanied by the Puttu, but worked just as well with the layered and very indulgent Malabar Parotta. A hidden gem that we absolutely loved was the Kathrikka Curry- baby eggplants cooked in a rich poppy seed and groundnut gravy- slightly sweet and tangy. Soak in the full bodied flavours and heady aromas of Kerala with a piping hot delivery from Mahabelly.